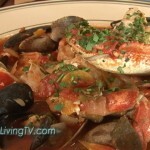 Party Girl Diet™ author and TV personality Aprilanne Hurley loves recipes that have a “story,” and shares the following coveted recipe for authentic San Francisco Crab Cioppino Recipe. 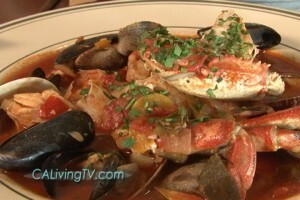 We are told Sam’s Anchor Cafe’s Crab Cioppino Recipe is the original recipe created in the early days of Sam’s Anchor Cafe, and has only been modified slightly over the year to make preparation, for instance the crab is cracked and the crab is picked out of the shells ahead of time to enhance the diners eating pleasure. Aprilanne Hurley is a Certified Specialist in Fitness Nutrition, Certified Lifestyle Fitness Coach, Author of The Party Girl Diet, and series creator/host of California Living®, California’s premiere lifestyle show delivering the Insider’s Guide to California food, travel, and healthy living. Hurley’s Party Girl Diet book and Kindle (e-book edition) are available on Amazon.com.